South African Rand mousepads, Krugerrand boxer-shorts, Rhodesian Dollar mousepads and cool mugs at our cool new Rhodesian Dollar Store and Rand Store. 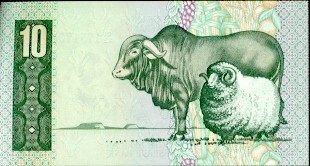 For the new (post-1994) South African notes, click here. 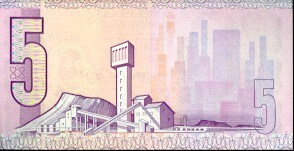 The old South African notes (used under apartheid), reflected Afrikaner culture and heritage. 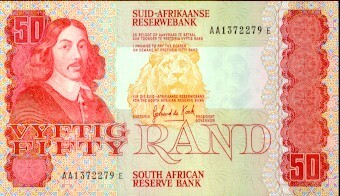 The obverse of the notes featured Jan van Riebeeck in the left panel, and a theme in the background beneath the text. 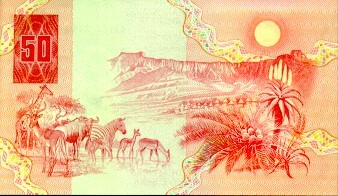 Afrikaans was the first language on the R2, R10 and R50 notes, while English was the first language on the R5 and R20 notes. 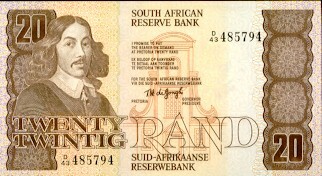 Jan van Riebeeck (1619-1677) featured prominently on the old South African rand notes, featuring on the obverse of each note. 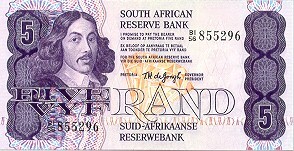 Van Riebeeck was the Dutch colonial administrator who established Cape Town in 1652, and is a significant figure in South African, and especially Afrikaner, history. 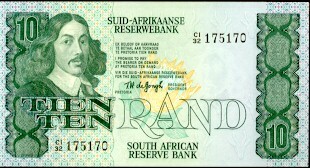 Many Afrikaners view van Riebeeck as the father of the Afrikaner nation. 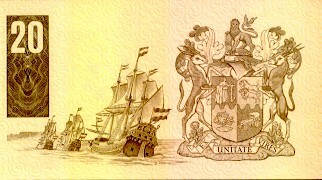 Van Riebeeck also featured on the reverse of the R20 note, albeit indirectly, with an image of van Riebeeck's landing party (three ships) and the (old) South African Coat of Arms, with the Latin motto "Ex Unitate Vires" -- "From Unity, Strength" (also translated as "Unity Creates Strength"). "Ex Unitate Vires" was South Africa's motto until 27 April, 2000, when the new Coat of Arms and motto were adopted. Variations of the old motto were common in many Afrikaner and South African institutions, often in Afrikaans ("Eendrag maak mag") or Dutch ("Eendragt maakt magt" in old orthography, "Eendracht maakt macht" in modern orthography).